Kemi Adeosun, Nigeria’s finance minister, and Babatunde Fowler, the country’s tax czar heading the Federal Inland Revenue Service, were among a few other notable individuals and organisations that received merit awards from Nigeria’s leading body of accounting practitioners, the Institute of Chartered Accountants of Nigeria (ICAN) over the weekend in Lagos. 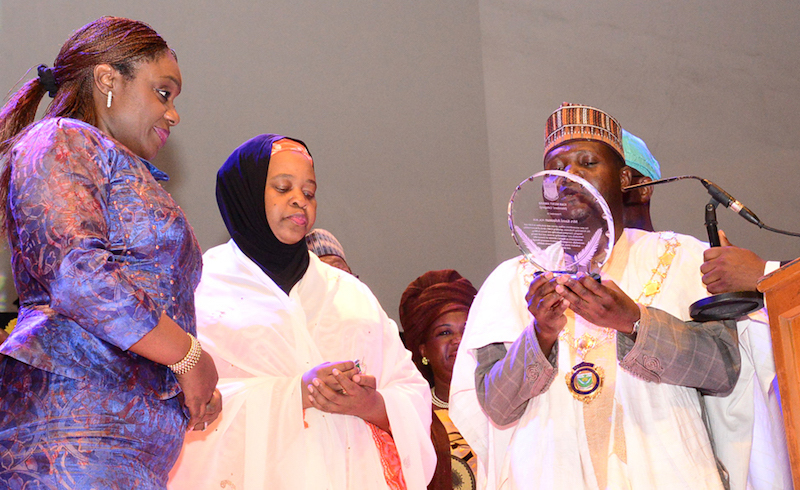 Isma’ila Muhammadu Zakari, ICAN president said Adeosun was honoured for her exemplary and distinctive contribution to the growth of the Nigerian economy and leadership quality. “This honour is in recognition of your outstanding contributions to the ideals of our Institute which include: Accountability, Integrity, Honesty, Exemplary Leadership and Nation Building. “Particularly for your selfless service as Nigeria’s minister of finance and for your roles in strengthening the Nigerian economy and entrenching accountability through the introduction of 22 Points Fiscal Reform Action Plan and the Voluntary Assets and Income Declaration Scheme,” the ICAN boss said. A statement by the minister’s spokesman, Olayinka Akintunde, said Adeosun has played leading roles in the development of various cost cutting initiatives through the pursuit of carefully thought out policies aimed at promoting transparency in the payment process, drastic reviews of the procurement process, and the sanitisation of the public-sector payroll system, which led to the elimination of huge number of ghost workers. “Under her leadership, numerous reforms agenda of the Federal Government had been undertaken such as the Voluntary Assets and Income Declaration Scheme (VAIDS), implementation of Treasury Single Account, implementation of Whistleblower Policy, establishment of an Efficiency Unit, establishment of Development Bank of Nigeria, launch of Asset Tracking and Management Project, and introduction Fiscal Sustainability Plans for States, among others,” Akintunde said. The ICAN merit awards were also bestowed on Babatunde Ajayi, the Akarigbo of Remo; Isiaka Abdulrazaq, group executive director, finance and accounts of the Nigerian National Petroleum Corporation, and Margaret Unubun, a fellow of the institute. The University College Hospital (UCH), Ibadan and Fate Foundation received the institute’s merit award in the corporate category, while a posthumous award was given to Zubair Abdullah and Uchenna Ifesinachi Erobu.